The REACTION platform consists of subsets of production servers for data management, security, application execution and communication. All servers interoperate on the basis of web services and are thus completely platform agnostic and scalable. A software development toolkit allows for rapid development of REACTION applications. The REACTION platform connects to sensors and devices in the Patients’ Sphere and to healthcare professionals and informal carers as well as emergency and crisis management teams in the Carers’ Sphere. It also connects to Health Information Systems (HIS) and external medical knowledge repositories (e.g. biomedical models) and security providers as visualised in the figure. Wearable medical sensors are connected in a Body Area Network (BAN) for multi-parametric recording of vital physiological parameters. The BAN interconnects with other sensors in the environment that can record contextual information about the other vital parameters and the patients’ activities. Data are pre-processed and formatted in the access layer active nodes/ gateways, which operates personalised software bundles in an OSGi (Open Service Gateway initiative) framework. The gateway can also handle simple episode monitoring and alarm handling and other services, which are needed during periods of non-connectivity. The gateway also manages personalised feedback from health professionals adapted to the available user terminals, as well as self-monitoring and autonomous regulation of the connected devices in the BAN. For devices not capable to operate web services (due to resource constraints or proprietary concerns), the gateway also dubs as a platform for virtualisation of devices. Data are transmitted securely to and from the REACTION platform through fixed or mobile public or proprietary networks. 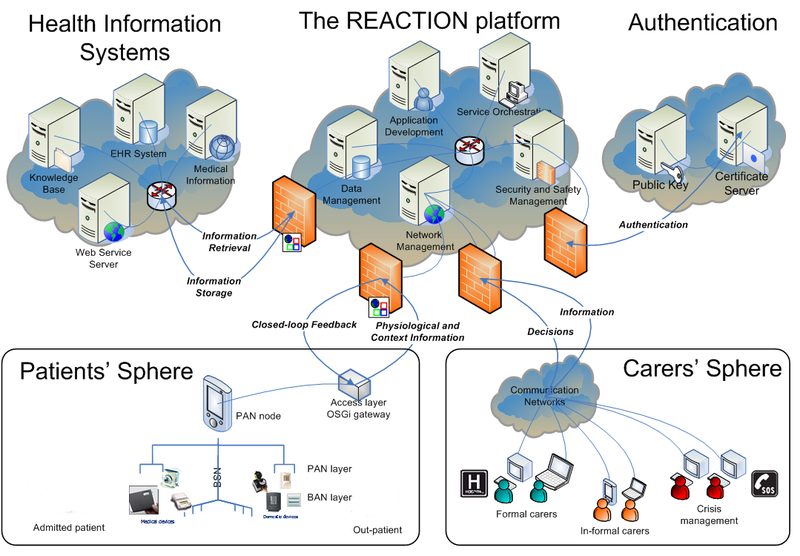 The REACTION platform is the central production environment for the deployment of REACTION applications. It consist of five subsets each responsible for their part of the overall functionality. The Data Management subset is central to the high level functioning of applications and services deployed on the platform. It implements the model-driven architecture for application development and deployment, the service oriented architecture for core service functionalities, data manipulation, data fusion and event handling. It also manages data transfer to and from nodes and stakeholders in a REACTION environment. The Network Management subset is responsible for the physical communication between devices, persons and external repositories. Each PAN node will have its own Network Manager and each Network Manager will have an external Web Service based interface where it can exchange data with remote Network Managers. The Security Management subset will perform mapping and brokering between security models, user and client devices profiling management, mapping and usability between trust domains, and semantic standards and generalisation ontologies development. The Application Development subset is an open SDK toolkit for model-driven development of applications that use the REACTION platform. Applications are developed and deployed to execute comprehensive tasks. Each application serves specific goals and is constructed from a series of standardised workflows and business rules. An example of this could be monitoring of a patient’s correct insulin intake. One workflow consists of reading blood glucoses levels and dietary intake at determined intervals. Another workflow will determine recommended bolus dose (fast acting) insulin from these readings and feed it back to the patient. A third workflow will read the actual insulin intake whereas a fourth workflow will compare the two and fuse the information to various stakeholders. Applications are developed and stored in the form of conceptual domain models (ontologies). The domain model describes the functionality, the objects involved (devices, users, rule sets, repositories, etc), the security model to be used and the run-time environment. Applications are easy to build, modify and deploy and features very effective application development and roll-out to various locations. The REACTION platform connects to a broad range of stakeholders and provides multiple ways of feedback to the patient or to any object in the Patient’s Sphere, including actuators. Data, information and knowledge are transmitted in personalised form from the Data Manager to various stakeholders. Medical information and clinical pathway assessment and adjustment, medication adjustments or general medical information is available to healthcare professionals in hospital wards, outpatient clinics, general practice, therapy and rehabilitation centres, etc. Health status, risk assessments, self-management incitements, and other data about the patients are transmitted to patients and other informal carers such as family members, friends, neighbours etc. Finally, contextualised health information is transmitted to crisis management centres and emergency response teams. The REACTION platform is based on seamless integration of wearable ePatch sensors and off-the-shelf medical devices, environmental sensors and actuators. A key objective in the REACTION project is to demonstrate the use of non-invasive and minimally invasive monitoring devices. Despite technological developments in sensing and monitoring devices, issues related to system integration, sensor miniaturization, low-power sensor interface circuitry design, wireless telemetric links and signal processing still have to be investigated. Moreover, issues related to quality of service, security, multi-sensor data fusion, and decision support are active research topics. The REACTION project will develop wireless body networks with wearable and non-invasive or minimally invasive sensors based on the electronic patch (or ePatch) concept. Body Area Networks will be used for multi-parametric monitoring of physiologic health data. Figure 4 ePatch sensor An electronic patch is a small body sensor, which senses physiological signals and is embedded in a skin-friendly adhesive. An ePatch looks like a normal plaster but contains various kinds of miniaturised body sensors for measuring physiological parameters, microelectronics for data analysis, a wireless radio module for communication and a battery power source. ePatch sensors have been developed for applications such as myographic recordings, skin temperature, and skin impedance. The monitoring can encompass multiple ePatches around the body for multi-parametric sensing. Wearable sensors will be connected through a patient centric Body Area Network (BAN). Decentralised decision support at the point-of-delivery (the patient) will be achieved with active nodes/gateways (PDA, Smart Phone operating personalised software bundles in an OSGi framework or Apples iPhone OS 3.0). Communication will be based on standards where possible.